The TEKXYZ Boxing reflex ball is a headband with a ball on a string attached to the headband. What are the benefits of using the TEKXYZ Reflex Ball? 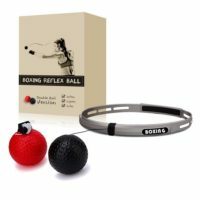 They are a great way to improve hand and eye coordination and your reflexes. It is a great workout! The unpredictability of the rebounding ball, coupled with the intensity of your punches will really burn out your arms, chest, shoulders and upper back, perfect for calorie burning and conditioning! Practice anytime and anywhere, small and portable. Specifically designed to be much lighter and softer than a tennis ball. Exclusive double ball design! The black ball is specifically designed to be much easier and once you can dominate the black ball, change to the red ball which is much more active.